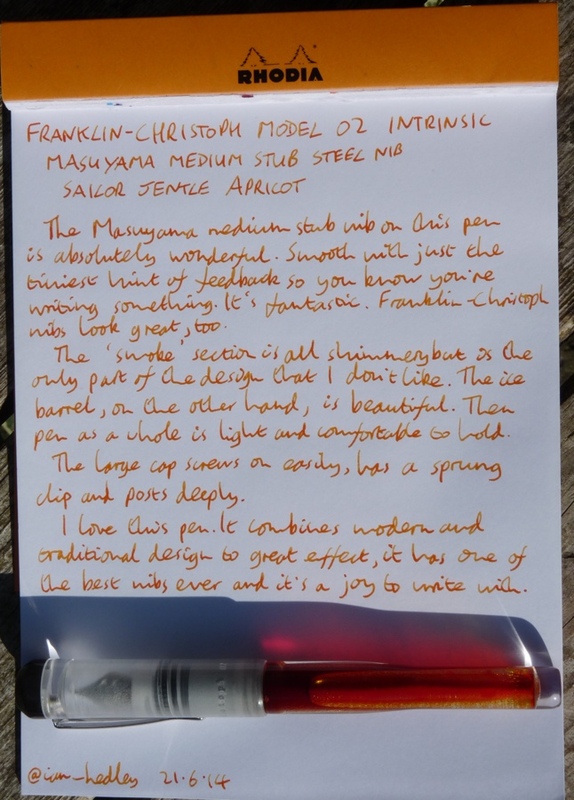 Franklin-Christoph Model 02 Intrinsic fountain pen review – Pens! Paper! Pencils! 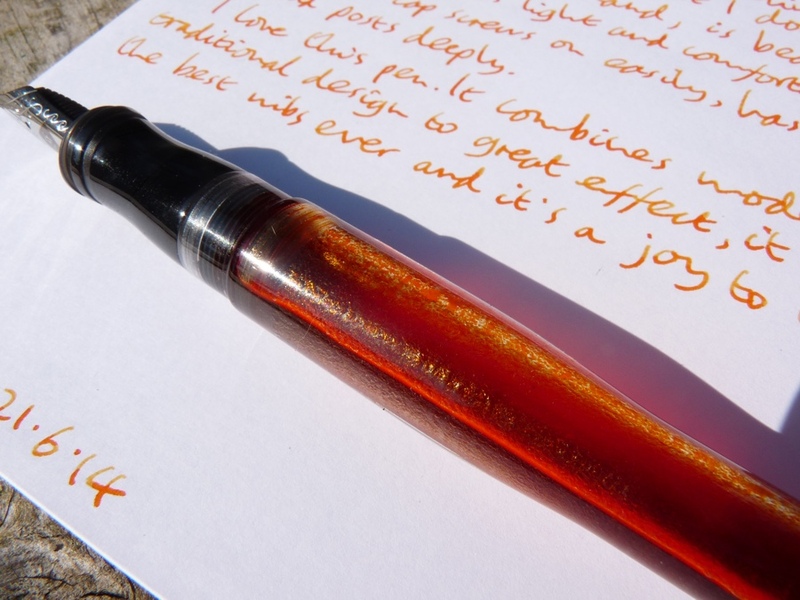 The Franklin-Christoph Model 02 ‘Intrinsic’ is an acrylic fountain pen that can be used as a standard international cartridge/converter or as an eye-dropper. It comes in three and a half different colours (black/maroon, black/cherry, smoke and ice, and emerald). This is the smoke and ice version. The barrel is the ice and the section is the smoke. The smoky section shimmers as you turn it and it’s quite a nice effect but, to be honest, I don’t especially like it. Just personal preference, I suspect, but I would have liked the section to have matched the icy barrel. If there had been an ice and ice version, I would have gone for that. 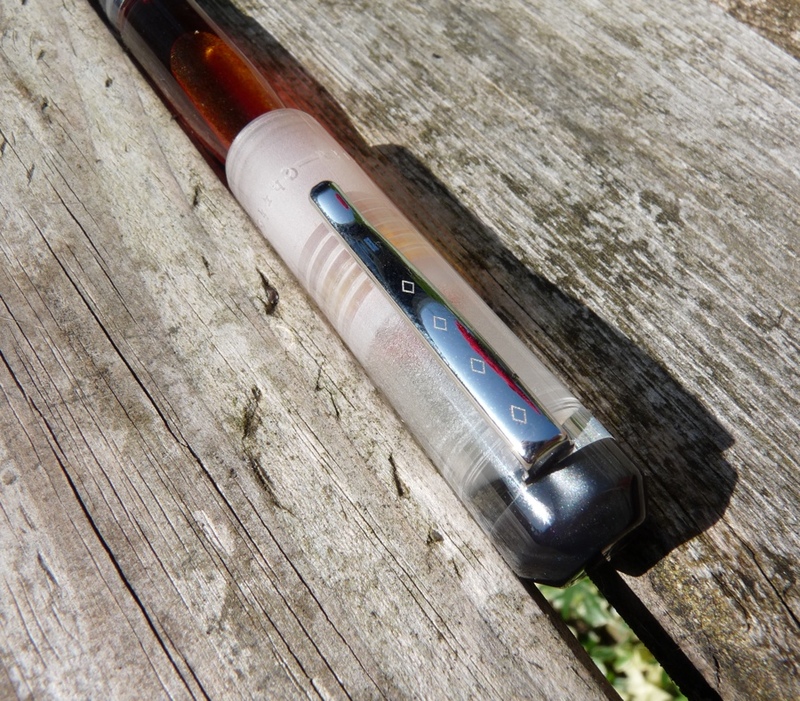 The icy barrel is gorgeous and absolutely begs to be used as an eye-dropper. It would be a waste not to do so. 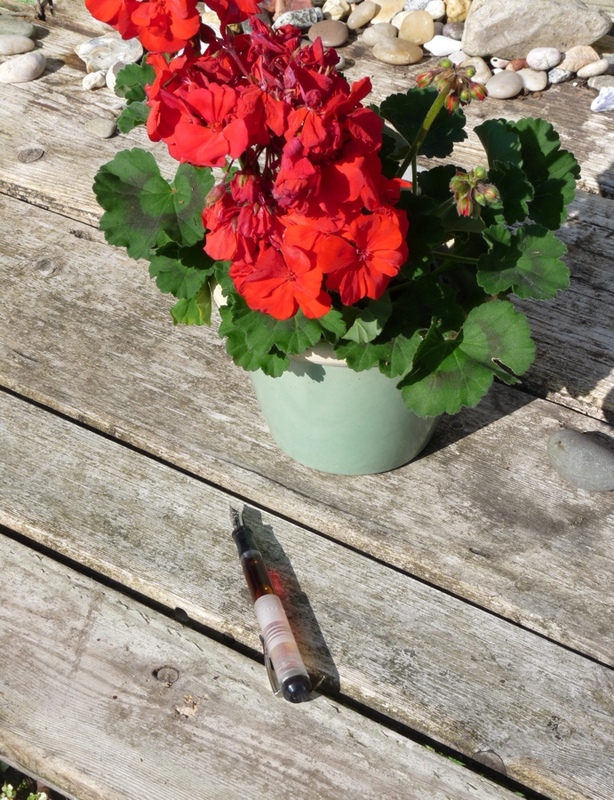 I used Diamine Monaco Red when I first got the pen and it looked classy and not a little like a blood-filled syringe. An excellent look. Then I filled it with a blue (I forget which) and it was cool and sophisticated. In these pictures it’s full of Sailor Jentle Apricot (RIP) and it’s warm and delicious. The pen completely changes its character whenever you change the ink. 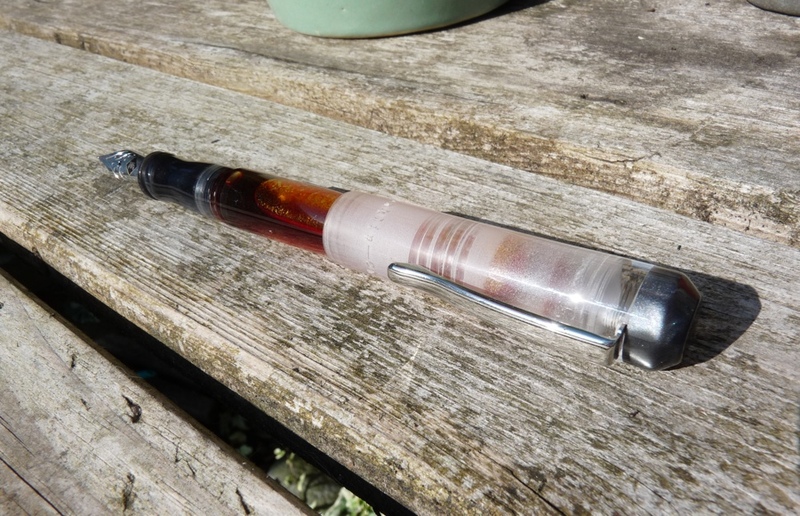 I’ve not had any problems cleaning the ink from the barrel except for a small ring right at the very end. With no ink in this is noticeable but once refilled it changes to the colour of the ink and it’s fine. This is a small issue for me but will bother some. The oversized cap has a sprung clip that is etched with diamond shapes. The end is etched with the Franklin-Christoph logo and “Franklin-Christoph 02” is etched around the rim. This all works very well and sums up the design of this pen: classy yet modern. The cap posts deeply. The nib… oh my goodness! The Franklin-Christoph Model 02 is available with 20 different nibs. There are six standard steel nibs and four standard gold nibs; and five Masuyama ground steel nibs and five Masuyama ground gold nibs. I picked a Masuyama medium stub steel nib and it is gorgeous. It’s silky smooth but has just the tiniest bit of feedback, just enough to let you know you’re writing something on paper. It lifts the colour of the ink and gives it life on the page. I love it. 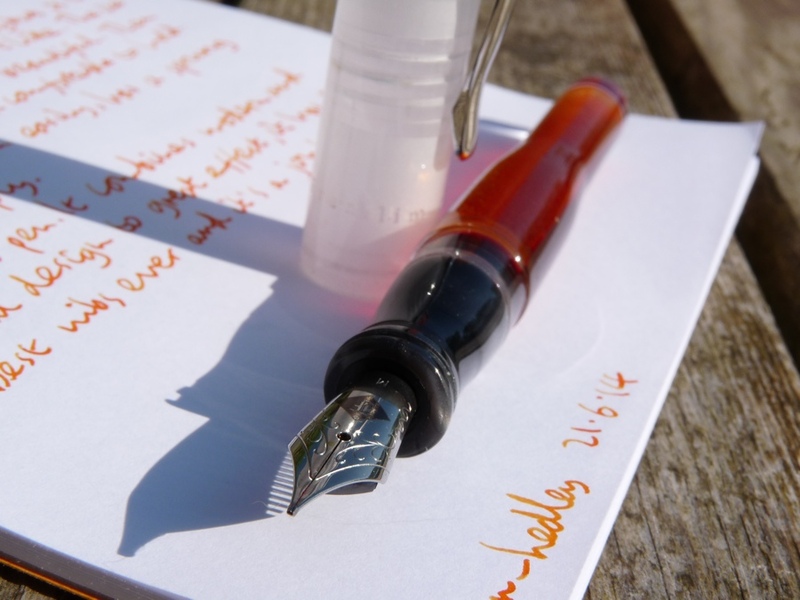 The Franklin-Christoph Model 02 Intrinsic is a beautiful looking pen that exudes modern class. It is comfortable to hold, light but solid-feeling, large but ergonomically shaped, and it is fantastic to write with. I absolutely love this pen. 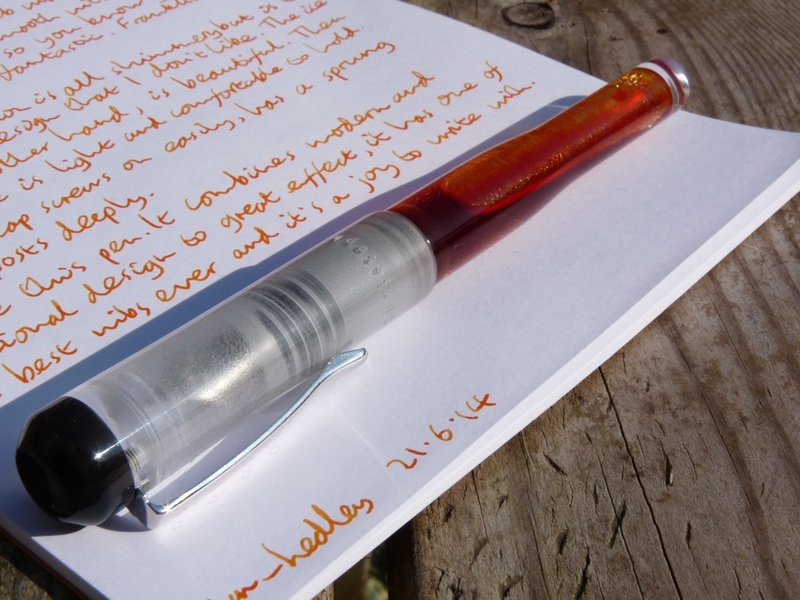 Nice review of one of my favorite pens. I went for the XF nib since I knew I would use it more but it is hard to pass off the inexpensive upgrade to a Mike Masuyama nib. So far no staining for me but I did have to use some pen flush to clean ink from then end you saw staining on. Thanks for stopping by Ray. I bought my M27 with an XF nib originally and it’s a lovely nib. However I’m in a bit of a stub phase at the moment and not only bought this pen with a medium stub but also got a replacement medium stub for the M27! Enjoyed the review. I’ve been itching for my first F-C pen, and this is making the decision a bit harder. I’m kind of leaning towards the M19 at the moment, but so many great options! I don’t think you can go wrong with any of them! Thanks. It’s not like I needed to crave yet another pen! I don’t like eyedroppers, but your pictures in this review are making that a hard position to hold. Beautiful. Thanks Mike. It’s a beautiful pen. Thanks for the link! I am so jonzing for either the 02 or the 40. 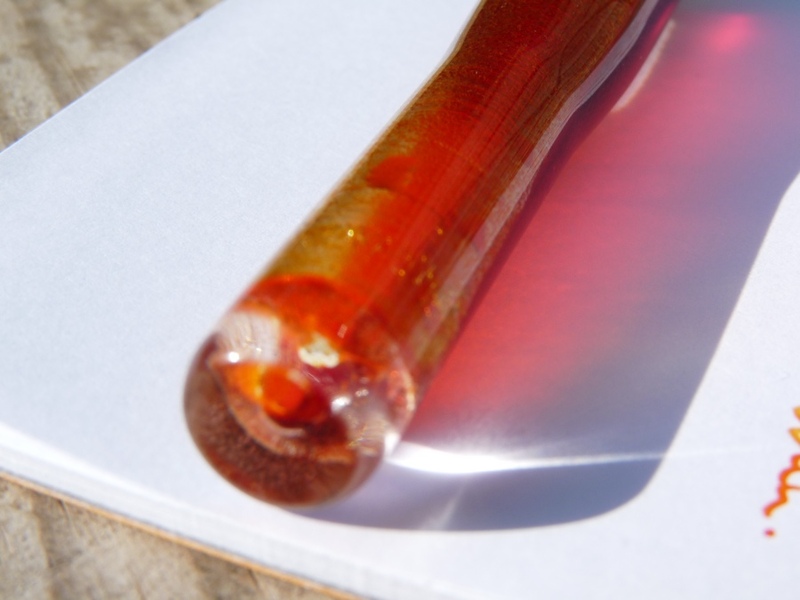 They look so cool as an eye dropper. Nice review! Excellent review! Thank you for your time on this. Thanks Robert! 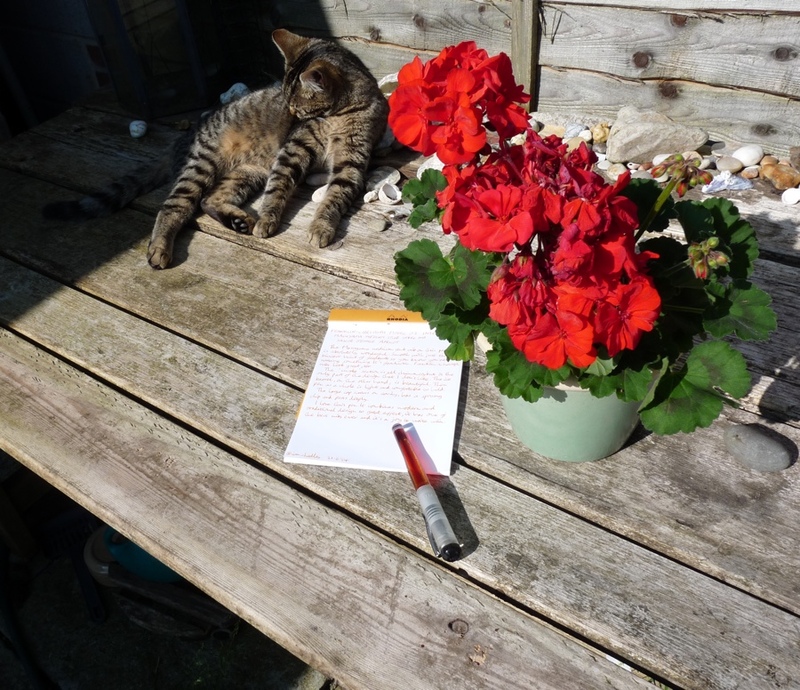 To be honest it’s easy to write a review about a pen this lovely! Hi Ian, as you can see I’m wandering around inside your blog picking up on things that really interest me – do you know where in the U.K. I could find an Intrinsic and for what price (ish)? Also, your use of images has completely driven me away from my plan to set up a pen and ink blog to something that better suits my talents. Keep your eyes open for Car Seat Covers, Wheel Trims and Airfresheners . More soon…. As far as I know they’re only available direct from Franklin-Christoph in the US, which means you run the gauntlet of shipping (reasonable) and customs (not so much) charges. If that puts them out of reach (they are worth the cost but they are not cheap) then they do sometimes come up second hand. I’ve picked up two F-Cs like that (a M40P and a M03). You should do a pen and ink blog! There’s always room for more.